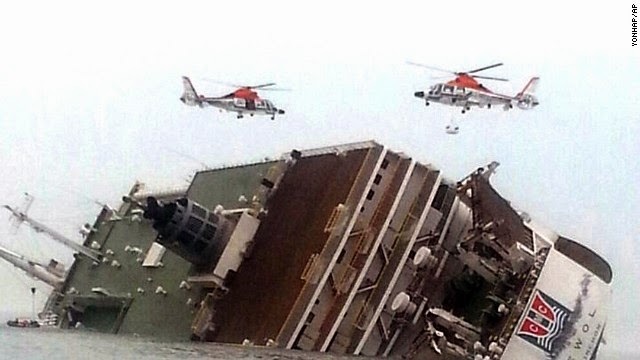 Ship with 476 passengers sinks off South Korea (Video) - Balita Boss! A passenger ship carrying a total of 459 people, mostly high school students, sank off South Korea’s southern coast on Wednesday, April 16, 2014. According to Chosun report, the 6,325-ton vessel left Incheon at 8:30 p.m. on Tuesday and was to arrive at southern resort island of Jeju later on Wednesday. Also known as “South Korea’s Hawaii”, Jeju Island is one of the country’s most popular tourist destinations. The distress signal was received from the ferry around 9:00 a.m. (local time). The ship ran into trouble some 20 kilometres off the island of Byungpoong. “We heard a big thumping sound and the boat stopped,” one passenger told the YTN news channel by telephone. As of 11:00 a.m., the passenger ship was about to go under completely. A total of 147 passengers were rescued, Lee Jae-youl, a Ministry of Security and Public Administration official said. According to CNN report, South Korea’s coast guard said that there is at least one death and 161 rescued around 11:35 a.m.
Out of 459 people, 164 have been rescued, two died and 293 remain unaccounted for, officials said. The ship has a capacity of some 900 passengers and had enough life jackets for 459 on board. The cause of the accident was not immediately known. Yonhap reported that President Park Geun-hye ordered all available vessels nearby, along with Navy and Coast Guard, to contribute to the rescue effort.